Impact Dynamics is a think tank from Peshawar. Through offering consultation, and conducting technical and soft skill workshops for budding startups, Impact Dynamics helps them grow and expand their operations. 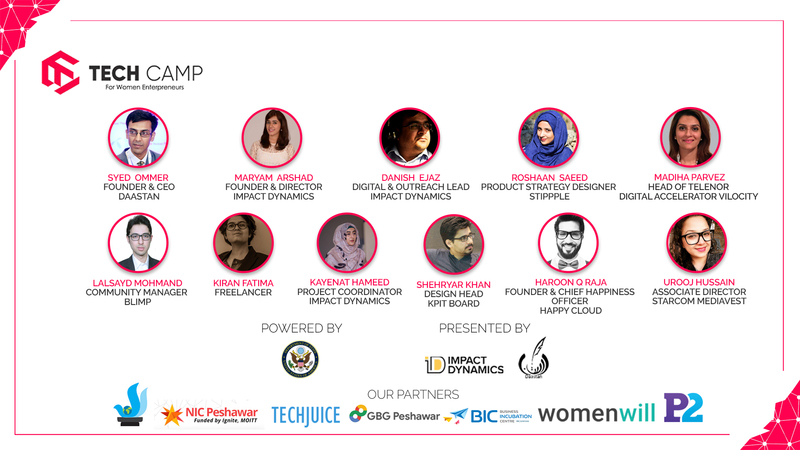 Impact Dynamics, in collaboration with Daastan, a literary forum whose mission is to revive, revamp, and run the literary Industry of Pakistan, is conducting Peshawar’s first ever boot camp for women. 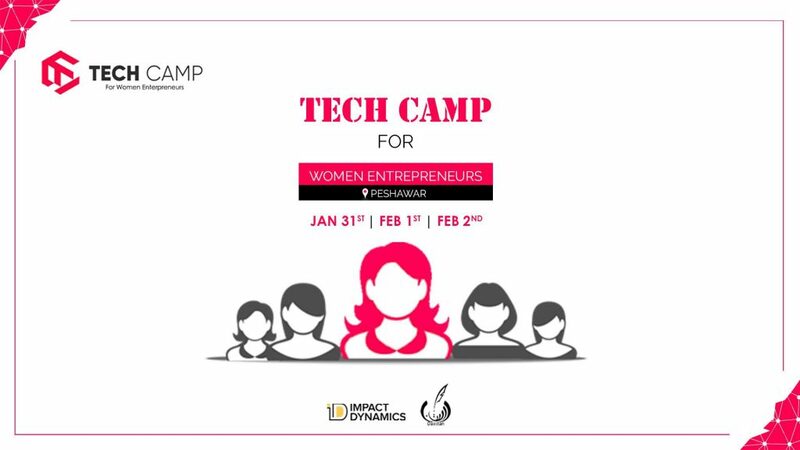 Tech Camp for Women, a three-day free accelerated boot camp is set to happen on 31st of January till 2nd of February. This event is being powered by the US State Department. This Event will specially focus on women-led startups and SMEs (small to medium enterprises). The aim is to enable them to build a better online presence to upscale their businesses. Technology is one of the key features that can help a startup grow during its initial phases. Coaches from all across Pakistan will guide the participants to perfect their pitch and learn the right tips, tricks and hacks to grow their businesses. The training sessions will incorporate sessions on Pitching, Growth Hacking, Social Learning, Social Media Marketing Hacks (for all major platforms), Digital Storytelling, The Art of Storytelling, Google Ads and Google Analytics. With over 10 years of experience in Integrated Marketing Communications. Urooj has worked extensively with both multinational giants as well as local corporations & SMBs to drive cost-effective communication solutions across all media platforms. In her session, she will talk about how SMB’s can use digital marketing to maximize awareness and conversions in a highly competitive market. Shehryar is an award-winning Visual Communication Designer who is currently working as a Designer in Residence at Khyber Pakhtunkhwa Information Technology Board – KPITB. He influences in his work by envisioning, creating, and contributing to design practices, culture creation, strategy, design thinking facilitation, and education. Kayenat is part of founding team at Impact Dynamics and works there as a Project Coordinator. She is also an author of the book “A Decade of Delight” and is Peshawar’s first spoken word artist, who debuted for Words and Metaphor. In her session, she will be guiding about “Leadership: Being and doing” at the Tech Camp for Women Entrepreneurs. Roshaan has hands-on industry experience of UX/UI design and vast hands-on experience on big data, data visualization, and healthcare tools that enable her to empower female freelance designers to compete worldwide through her company Stippple. She is a pioneer who initiated the movement on UX/UI design community building in Pakistan. She is the official representative of global design platforms like Dribbble and Glug in Pakistan where she organizes events to showcase the local design talent on a global level. In her session, she will guide Startups about Rapid prototyping (RP) and how it helps entrepreneurs shorten the design cycle by letting them make in hours than a prototype that would have taken a week without it. Ommer is a storyteller, who is on a mission to collect, narrate and market tales from the land of the pure on a global level. He is a content guru who specializes in copywriting, script writing and technical writing. He knows how to build, scale and sustain social enterprises through bootstrapping. He defines himself as a passionate cause-based visionary who loves to network and collaborate to maximize social impact. In his session, he will guide Startups & Entrepreneurs about how the content can make or break a brand and will further explain the techniques to develop content that can build your brands with the passage of time. Maryam is Founder & Director of Impact Dynamics. She also leads GBG Peshawar & was a founding team member as well as the former community manager of National Incubation Center. She strongly believes in innovation, digitization, and education as the way forward for not just start-ups but for everyone. In her session, she will talk about Growth Hacking in which she will not just explain the concept and dynamics of it but will implement some hacks for greater learning. Madiha Pervez is an incubation expert and ecosystem builder. Currently Madiha heads Telenor Pakistan’s Digital Accelerator – Telenor Velocity. In her session, she will talk about the art of pitching and different pitching techniques. Danish Ejaz is the Digital Marketing and Outreach Lead at Impact Dynamics. He is also a veteran Marketing Expert & an Entrepreneur who aims to provide maximum benefit to people based on the knowledge he has acquired from his professional marketing experience. In his session, he will talk about social listening and its impact on business and how you can use these techniques to ensure maximum engagement that can lead to higher customer acquisition. Kiran is a film artist and a documentary photographer and has been working with art and technology for the past five years. She studied film and media production from NUST. She has since been actively engaged in film productions and online campaigns addressing different abilities and immersive art that questions and challenges norms. She was also a part of the Parwaz Film Lab which was powered by the European Union and has studied Modern Art and Ideas from the Museum of Modern Art. In her session, she will share the powerful techniques of Digital Storytelling and will talk about how narrative brings a perspective to a story. Lalsayd is an engineer turned Search Marketer, He works as a Community Manager for Blimp and PPC Associate at Rungs. He has also been freelancing for organizations like Crowd Digital Marketing. In his coaching session, he will focus on Google Ads and will educate participants about the In’s & Out’s to ensure maximum reach of your message to your customers. Haroon has been working in the tech industry since the late ’90s and has acquired a repertoire of skills spanning across web and application development, server configuration and optimization, user experience design and optimization, project management, technical writing, search engine optimization and beyond. He is Founder & CEO of Happy Cloud which is a premium WordPress cloud hosting platform targeted at SMBs & Professionals. In his session, he will talk about personal branding and will guide the participants about how they can groom and present themselves as a brand. With a blend of business and technology, Tech Camp for Women Entrepreneurs is targeting women who want to make the optimal use of business hacks and technology to improve their business processes. Apply now to give your business an online transformation. Furthermore, you can also check the event page on Facebook for more information.